The newly invented airplane entered World War I as an observer of enemy activity (see The Beginning of Air Warfare, 1914). The importance of the information gathered by this new technological innovation was made evident to all the belligerents in the opening days of the conflict. The equal importance of preventing the enemy from accomplishing this mission was also apparent. The French were the first to develop an effective solution. On April 1, 1915 French pilot Roland Garros took to the air in an airplane armed with a machine gun that fired through its propeller. This feat was accomplished by protecting the lower section of the propeller blades with steel armor plates that deflected any bullets that might strike the spinning blades. It was a crude solution but it worked, on his first flight Garros downed a German observation plane. Within two weeks Garros added four more planes to his list of kills. Garros became a national hero and his total of five enemy kills became the benchmark for an air "Ace." However, on April 19, Garros was forced down behind enemy lines and his secret revealed to the Germans. Dutch aircraft manufacturer Anthony Fokker, whose factory was nearby, was immediately summoned to inspect the plane. The Germans ordered Fokker to return to his factory, duplicate the French machinegun and demonstrate it to them within 48 hours. Fokker did what he was told and then some. Aware that the French device was crude and would ultimately result in damaging the propeller, Fokker and his engineers looked for a better solution. The result was a machinegun whose rate of fire was controlled by the turning of the propeller. This synchronization assured that the bullets would pass harmlessly through the empty space between the propeller blades. Although Fokker's demonstration at his factory was successful, the German generals were still skeptical. They felt that the only true test of the new weapon would be in combat. Fokker was informed that he must make the first test. Fokker dutifully followed instructions and was soon in the air searching for a French plane whose destruction would serve as a practical demonstration of his innovation. Finding one, he began his attack while the bewildered French crew watched his approach. As his prey grew larger in his sights, and the certainty of its destruction dawned on Fokker, he abandoned his mission, returned to his base and told the Germans that they would have to do their own killing. A German pilot soon accomplished the mission and orders were given that as many German planes as possible be fitted with the new weapon. The airplane was no longer just an observer of the war; it was now a full-fledged participant in the carnage of conflict. "I thought of what a deadly accurate stream of lead I could send into the plane." ". . .while I was flying around about 6,000 feet high, a Farman two-seater biplane, similar to the ones which had bombed me, appeared out of a cloud 2,000 or 3,000 feet below. That was my opportunity to show what the gun would do, and I dived rapidly toward it. The plane, an observation type with propeller in the rear, was flying leisurely along. It may even have been that the Frenchmen didn't see me. It takes long practice and constant vigilance to guard against surprise air attack, for the enemy can assail one from any point in the sphere. Even though they had seen me, they would have had no reason to fear bullets through my propeller. While approaching, I thought of what a deadly accurate stream of lead I could send into the plane. It would be just like shooting a rabbit on the sit, because the pilot couldn't shoot back through his pusher propeller at me. As the distance between us narrowed the plane grew larger in my sights. My imagination could vision my shots puncturing the gasoline tanks in front of the engine. The tank would catch fire. Even if my bullets failed to kill the pilot and observer, the ship would fall down in flames. I had my finger on the trigger. . .I had no personal animosity towards the French. I was flying merely to prove that a certain mechanism I had invented would work. By this time I was near enough to open fire, and the French pilots were watching me curiously, wondering, no doubt, why I was flying up behind them. In another instant, it would be all over for them. Suddenly, I decided that the whole job could go to hell. It was too much like 'cold meat' to suit me. I had no stomach for the whole business, nor any wish to kill Frenchmen for Germans. Let them do their own killing! Returning quickly to the Douai flying field, I informed the commander of the field that I was through flying over the Front. After a brief argument, it was agreed that a regular German pilot would take up the plane. 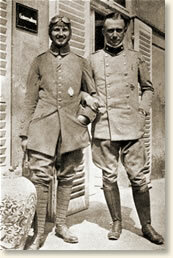 Lieutenant Oswald Boelcke, later to be the first German ace, was assigned to the job. The next morning I showed him how to manipulate the machine gun while flying the plane, watched him take off for the Front, and left for Berlin. The first news which greeted my arrival there was a report from the Front that Boelcke, on his third flight, had brought down an Allied plane. Boelcke's success, so soon after he had obtained the machine, convinced the entire air corps overnight of the efficiency of my synchronized machine gun. From its early skepticism headquarters shifted to the wildest enthusiasm for the new weapon." This eyewitness account appears in: Fokker, Anthony H. G., Flying Dutchman (1931); Cooke, David C., Sky Battle 1914-1918 (1970); Reynolds, Quentin, They Fought for the Sky (1957). "The Birth of the Fighter Plane, 1915," EyeWitness to History, www.eyewitnesstohistory.com (2008). Roland Garros, the French pilot who first strapped a machine gun to his airplane, escaped from German captivity in February 1918. Rejoining the French air corps, he was shot down and killed in combat over the Ardennes Forest in October 1918 - just five weeks before the end of the war and one day shy of his thirtieth birthday. In 1928, a new tennis stadium in Paris was named after Roland Garros. The tennis center is the home of the annual French Tennis Open and the tournament's official name is the Roland-Garros Open.